This project has been on my "to do" list for a long time! I've always loved the dressed up look of pelmet boxes, but didn't want to invest in a scroll saw (or any of the other tools you probably need for that matter). I saw a tutorial for pelmet boxes on Little Green Notebook about a year ago, she made them using foam core board!!! I thought it was a BRILLIANT idea! I could definitely do that, so I did! First I sketched half of my pelmet box shape onto the foam core, I cut it out with an exacto knife and used it for a template. Next I cut out all 4 pieces (I made 2 boxes) and cut smaller pieces for the sides of my boxes. Then I just pulled and stapled the fabric and batting to the board. Tip: cut slits in the fabric around the rounded parts to get the fabric to lay flat. To hang the box, I hot glued a curtain rod to the back of the sides and hung it on the wall, super easy! This is gorgeous ~ thank you! Megan that turned out fantastic!!! Wow, this is great and affordable to do! Thanks for sharing! Not sure now, did I just comment here how lovely this window treatment is. I meant to say, it's darling and thrifty and do-able.. i never thought of using such lightweight material, but it makes sense. ..or, check my home page for the lastest blog party, okay?! 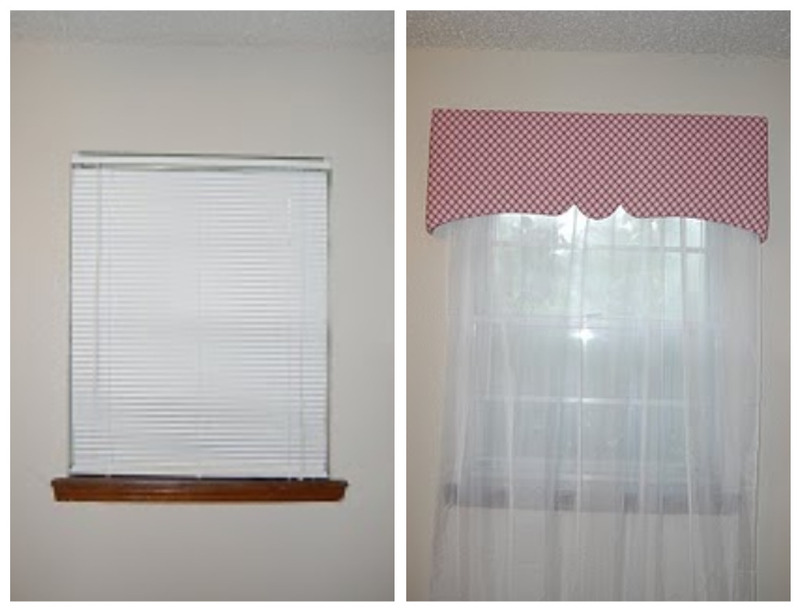 Great job on your window, you've picked out beautiful fabric too! I've got this linked to my pelmet boxes post too today, well done!